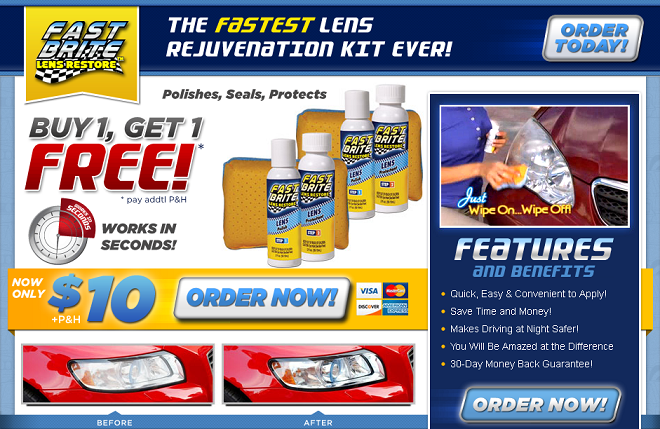 Fast Brite is a headlight lens rejuvenation kit that quickly removes oxidation. Does it work as advertised? Here is our Fast Brite review. Fast Brite is a formula for headlight lenses that rapidly clears the outer level of oxidation to restore brightness. The official website is fastbriteorder.com, with a registration date of June 2012. The screen capture below was taken of the product website in July 2017. A Fast Brite kit costs $10.00 + $7.95 P&H for a total of $17.95. There is a double offer for a separate fee of $7.95 which would bring the total to $25.90. Each kit comes with a 2oz. bottle of Fast Brite Lens Polish, a 2oz. bottle of Fast Brite Lens Protectant, and an application sponge. You can find Fast Brite in stores for about $10. I even saw it at a local CVS on clearance for $5 in July 2017. If you have suffered from cloudy, oxidized headlights, the makers of Fast Brite may have just the item for you. This is a headlight restoration kit which supposedly transforms your headlights to “showroom new in as little as 30 seconds.” To use Fast Brite, you simply wipe it on and wipe it off. Fast Brite has been around for a number of years, and you may have seen similar products come and go, such as Wipe New Headlight Restore. The advertising is compelling, showing dull, yellow headlights instantly restored to a new look with a simple wipe of this magical solution. My first-hand experience with this product is largely echoed by mixed reviews that can be found on Amazon. The first thing that most people will tell you is that it takes significantly more time and scrubbing to achieve results than the advertising implies. You can probably expect about a 33%-50% improvement, although there are consumers who have claimed anywhere from 0% to 100% success/fail rate. Also remember that foggy headlights can be caused by multiple factors, and your results could be affected by different variables than other consumers. Is the fogginess also on the inside? That may require a lot more work than simply wiping on and wiping off. In the end, I think that Fast Brite will under-perform for most people based on the advertising, but it will most likely deliver some results. If you see it on the clearance rack, it’s probably worth taking a shot. Because Fast Brite is not a new product, you can easily find reader comments for it, dating back about five years. Its current Amazon rating is 3.2 stars, although 48% of all ratings are only one star. The $14 3M Headlight Lens Restoration System is the most effective solution I’ve found for cloudy headlights. Its 4.5 star rating on Amazon tends to back up my opinion. As mentioned earlier, the Wipe New Headlight Restore is another As Seen on TV product in this category, and has been met with better consumer reviews. That item is also readily available in stores. What are your thoughts about Fast Brite? Drop a comment below and a star rating above to let us know what you think about it. Zuru Fidget Cube Review: Does it Work?